One of my favorite times of year has come again–farmers’ market season! Having moved back to Ohio, I no longer have the variety of the huge Baltimore Farmers’ Market and Bazaar. However, my market in southwest Ohio offers great produce from great farmers, and a lovely experience each week. AND I now have a big-kid sized kitchen in which to cook and prepare food! This week I couldn’t resist a lovely bunch of asparagus. To me, asparagus screams spring. I secretly hoped that my husband would volunteer to grill it before he left town for a business trip, but he ran out of time. 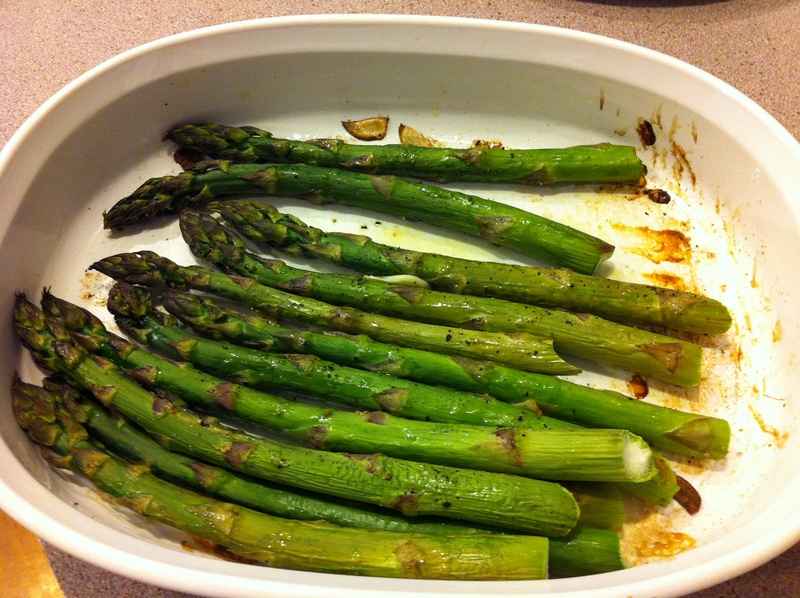 I couldn’t rationalize heating up the grill for just asparagus for just me, so I chose to roast it very simply instead. A quick internet search gave me a base recipe. My only changes were in quantity and the type of olive oil. I used a lemon infused oil to boost the flavor factor. Break off the rough ends of the asparagus. The beauty of fresh asparagus is that it will tell you the right place to break off the end. Just start to bend from the middle and the cut end, and wherever it snaps is where it’s meant to be trimmed. 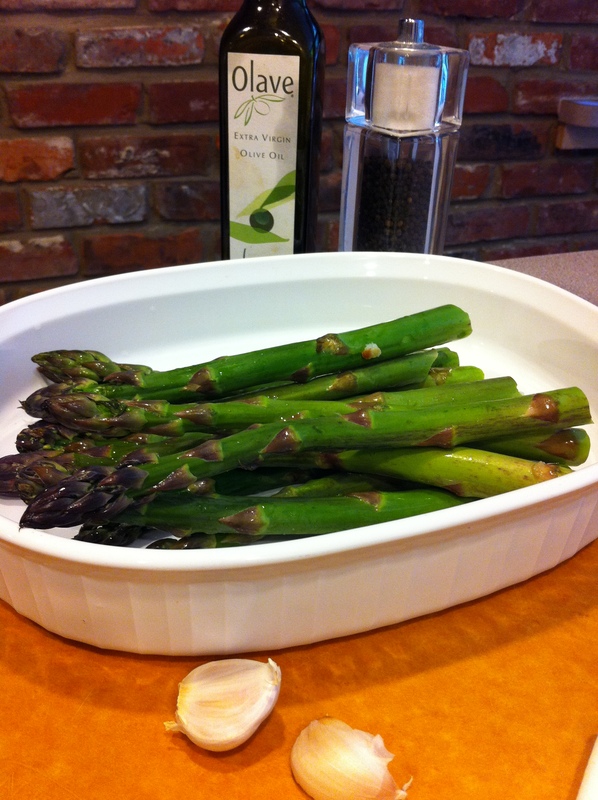 Lay the asparagus down in a roasting dish and add the sliced garlic cloves. Use as much garlic as you like. I’m keeping vampires away with my garlic level. 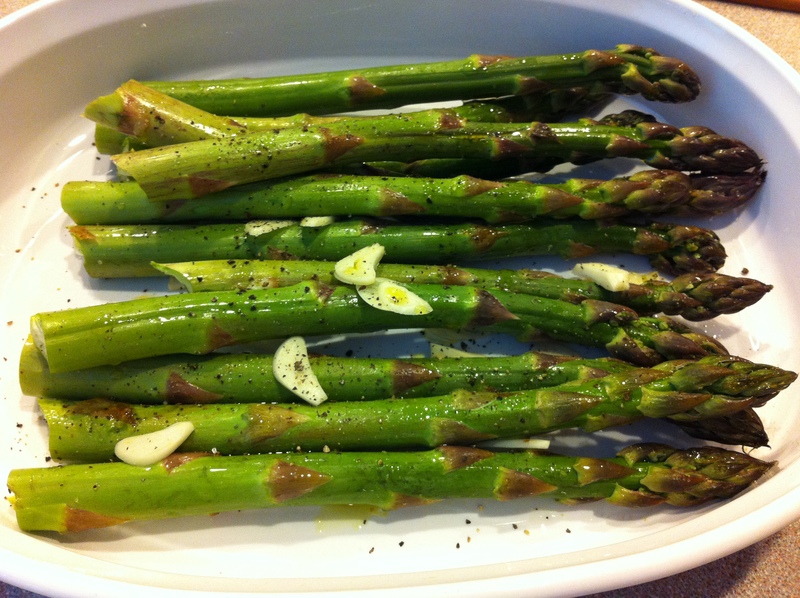 Drizzle the asparagus and garlic with olive oil-just enough to slightly coat the spears as you toss them. Sprinkle salt and pepper and toss lightly. Roast them for 10 minutes if the spears are thinner, longer for thicker spears. Mine took 12 minutes. As delicious as the simply roasted asparagus were, I wasn’t finished. 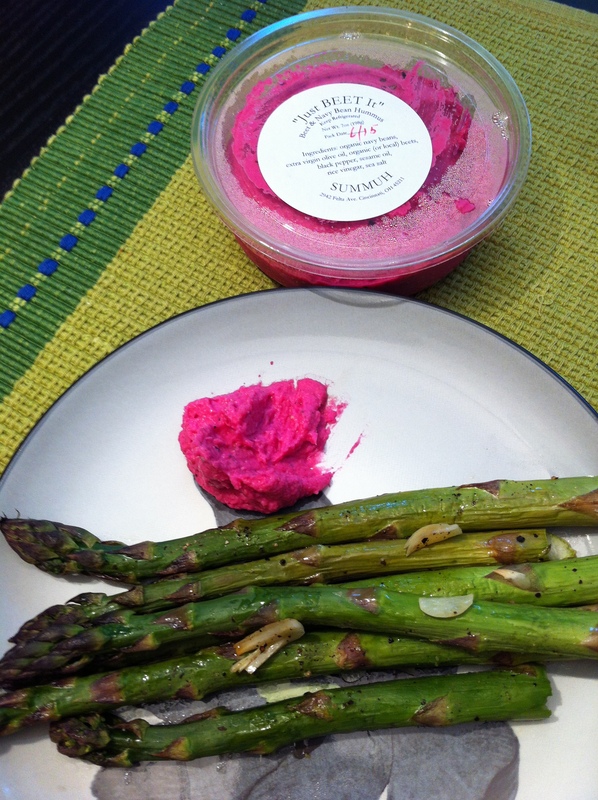 I added another farmers’ market favorite–Summuh‘s artisan hummus. Last week the husband and I went through two containers in about 3 days. This week I bought two for just me while the husband is away! (If you live in the greater Cincinnati area, hunt this stuff down!) This particular hummus is made with beets, which gives it its distinctive color. Dipping the asparagus into the hummus might have been a little messy, but it was delicious! I may have to do the exact same with the leftover asparagus. Looks yummy. I think we will have to grill some asperagus up together next time. Excellent brick wall back drop! Asparagus is synonymous with spring for me. What’s your summer flavor?